That churches are still being built in Italy, a nation where regular mass-goers make up less than 30 percent of the population and that possesses a birthrate that would make your Sicilian grandmother weep, is news not unlike Dr. Johnson’s comment about a dog walking on its hind legs: one is surprised it is being done at all, never mind questions about quality. 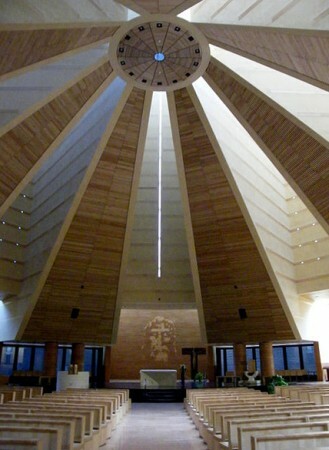 Yet Mario Botta’s 2006 Chiesa del Santo Volto, dedicated to the Holy Face of Christ, is, at first glance, at least interesting, if austerely modernistic. Built at a cost of 5 million euro in a former industrial neighborhood of Turin with the Frank Herbert-ish name of Spina 3 (literally, “Thorn 3”), it adjoins an office complex for the archdiocesan curia. It is the centerpiece of a larger town center complex repurposing the buildings of an abandoned set of steel mills―a heartening and humane urban gesture―and the church uses a number of recycled elements as well. As a consequence, a disconcertingly industrial feeling pervades the design. Botta has described the plan as reminiscent of a mechanical cog-wheel. The shaft-like central volume of the church is formed by an assemblage of seven towers, surrounded by a lower circle of fourteen further volumes, described as “nail-heads” by the architect. The massing, while vigorous, is unrelieved by any humanizing ornament to give a sense of scale save a diagrammatic cross, with the only real relief coming from the tops of periscope-like light-wells and the interplay of shadow on blank walls. The church’s campanile, a repurposed factory chimney, is crowned with an eminently legible cross. A filigree coil running round its shaft seems comparatively whimsical until one discovers it to be a spiral of metal thorns. The topsy-turvydom continues upon the discovery that the bells are mounted at the bottom of the chimney and not the top. The interior, which seats 700, is not without a certain blank majesty, and the immense stone holy water fonts are striking, inset in large stone portholes at the entrance. The massive altar is white marble, the sanctuary paving a glossy black, and the abstract-looking presider’s chair has an almost Pharaonic gravity to it. Yet, as with other modernistic churches, the architect seems to be shocked into an arid silence in the presence of the divine. This is, in some ways, a start―initum sapientiæ timor Domini, and an improvement on the Gentle Jesus of beige wall-to-wall carpeting―but it is hardly enough. Unlike churches of past ages that hid symphonic interiors within a simple shell, the interior is little more than ominous Philip Glass background music in a narrow spectrum of browns and beiges. The only icons appear to be a pixilatedly abstract interpretation of the face of the Turin Shroud inset into the back wall and a slim cross of light hovering far overhead. Both are almost invisible to the casual viewer. In an English description of the church, the translation speaks of “a conference room tomb” under the main level―presumably a crypt-level parish hall, but the Freudian slip nonetheless accurately describes the entire project. The industrial aesthetic that pervades the project is partially justified by the site’s history. Such tropes, if they are insisted upon, can be worked into sacred buildings without traumatizing the faithful too much. Edward Schulte’s mid-century modern-traditional cathedral at Salina, Kansas, draws on the Hollywood Midwest cliché of grain elevators in its design. It helps that the interior is embellished with genuine iconography and built on an authentic liturgical plan. The result is, nonetheless, not without problems. While something like this can be done, it ought not to be done often. The Great Plains are more than grain elevators, and presumably the good Christians of Thorn 3 are more than their Bogaro steel mills. Do people who live in an industrial park need to be so thoroughly reminded of the fact? Such an endless litany of cogwheels, smokestacks, and bare walls suggests a retrograde nostalgia for the heroic worker. Coming from a culture that spends its time behind a computer screen, the nostalgia is as sentimentalized as a china shepherdess, and less psychologically healthy. It is no wonder that the Italian factory-workers who scraped and saved their pennies to pay for the gaudy churches of Chicago did not build sanctuaries that looked like places that churned out shoes, beef, or steel. While often caricatures of the Old Country, they were cartoons of something good, true, and beautiful. Here, we have strayed into a bleak cityscape unworthy of de Chirico at his most cryptic. Everywhere one turns there appears a blank wall or a corner sharp enough to draw blood. It is a church dedicated to Christ in the tomb, but there must be room for Easter. It is a curiously bland evocation of Good Friday, lacking the splattery, operatic grandeur of Sicilian holy week or the black baroque gloom of the home of the genuine Holy Face, Guarini’s Holy Shroud Chapel, equal parts passion-flower and passion-nail. None of that here: God is dead, move along, don’t make a scene. It is all very tasteful. I am reminded, on reflection, of a recent essay by Dante scholar Anthony Esolen, who encapsulated everything wrong with the peculiarly epicene culture of post-modernity with the acerbic title, “When Drab is a Favorite Color.” This is the Passion for people for whom “oatmeal” and “eggshell” are favorite colors, or even colors at all. But Christ’s death was horrendously tacky. Nature cries out at the death of her Creator: the sun turns black, the moon turns to blood, earthquakes shake the world, and old men rise from their graves.